We know as parents, your greatest concern as you drop your children off at the church nursery is their safety. We have taken several measures to ensure your children are absolutely safe, secure, and enjoying their time in the nursery. For starters, we have a state of the art paging system that each parent receives when they drop off their child. If for any reason during the course of your child’s stay in the nursery you are needed, you will be promptly paged and given a message of your child’s need. We have also adopted and put into place several policies concerning who may work in the nursery. All nursery volunteers and paid nursery staff must fill out an extensive application and go through a national criminal background check. 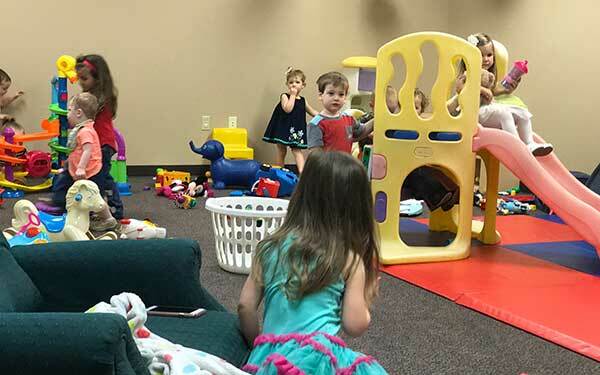 If there is any doubt of a persons reliability or trust, they are not permitted to work with the nursery, children’s ministry, or youth ministry. We also have several church members who work for different law enforcement agencies, and many of them are involved in our monitoring systems to keep your children safe. Our goal is your children’s safety when they stay in the nursery. Sunday Evenings (5:30 pm) Note: The nursery will open at 5:00 pm for children of parents involved in R.O.T.C. or other church programs. We know that children are truly a gift from God. Therefore, we consider it not only an honor but a responsibility to insure the very best environment possible for your children while in our care. Many thanks to our dedicated nursery staff and volunteers who work in our nursery. If you would like more information on our nursery, you may contact Macey Cooksey or Stacey Fisher.